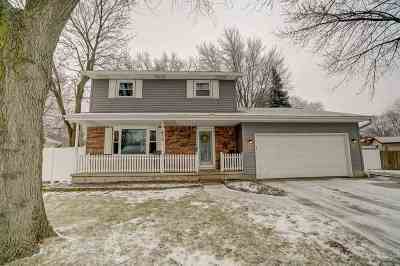 Beautiful 2 story in Sun Prairie, located on one of the largest lots in the city! This meticulously maintained home features 3 bedrooms, 2 bathrooms, finished basement, over 2300 sqft, 2 car garage, fenced in yard, and storage shed. Main level has spacious kitchen w/ (granite counters, newer appliances, island, lots of storage) living room, dining, full bath, and family room w/fireplace that leads to the beautiful back yard. Recent updates include updated flooring, bathrooms, windows, siding, and so much more. 1 Year Home Warranty Included.